Let me see a show of hands: How many of you have seen the endless parade of commercials touting one investment firm’s advantages over another, as well as the ones Charles Schwab runs that say all the big guys are full of bull? I thought so. Me too. The Investment Answer, aims to make all those ads -- and all those firms -- irrelevant. In clear-minded, cut-to-the-chase prose, authors Daniel Goldie and Gordon Murray lay down the essential principles for building a financial future using today’s volatile investment markets. In large part a primer hell-bent on providing clarity in a world of confusion, this book distills the investment wisdom of Wall Street veteran Murray. The impetus for the book was his imminent death, and in fact he recently passed away. This book, his legacy, turns Wall Street investing on its head, giving investors at every experience level the guidance they need to make money when and how they need to, to help make their personal vision of the future into reality. 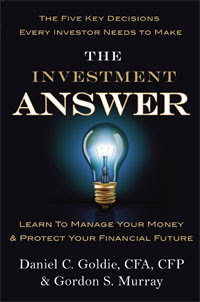 Between the covers of this read-in-one-sitting book (less than 100 pages), the authors discuss the five essential decisions to be made: the Do-It-Yourself Decision, the Asset Allocation Decision, the Diversification Decision, the Active versus Passive Decision, and the Rebalancing Decision. Do you need a broker or a financial advisor... or either one? Which areas of the market do you wish to invest in... and which would you prefer to avoid? How can you reduce risk by investing broadly, across several categories? How involved do you wish to be in your investments? And how must your investment decisions change when the market or your own financial circumstances change? Is the Literary World an Old Boy’s Club? The Death of the Book? Not Today.